Yesterday I wrote about a company that gets it, when it comes to rewarding customers for doing some of the marketing legwork for them. 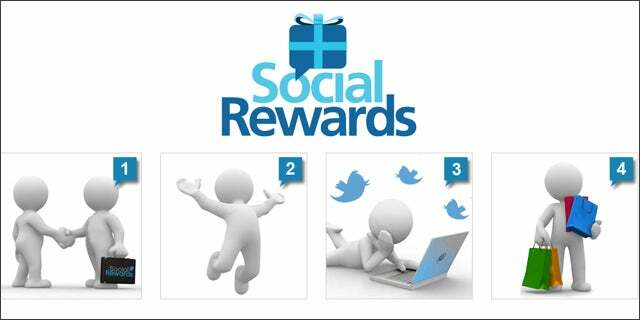 Social Rewards is another clued-in startup that realizes a simple “thank you” – in the form of rewards, of course – can go a long way in building brand loyalty and encouraging even more word of mouth marketing. Social Rewards is a loyalty marketing startup that helps companies identify brand advocates, enhance CRM data and increase social engagement. Its success revolves around the ability to capture ROI from social media via a tracking URL, allowing companies to follow brand messages and engagement from an initial Facebook post or tweet all the way to sales conversion. Users earn loyalty points for engaging in social media activity such as brand mentions on Twitter, Foursquare check-ins and Facebook Likes and fan activity. Then, Social Rewards turns social media activity into useful marketing data with full analytics reporting of brand mentions, clickthroughs, retweets, shares, and sales conversions. Founders and high school best friends Joe Morin and Mike Uesugi have been rewarded themselves with an oversubscribed seed round of angel funding totaling $600k, as well as a large chunk of the hotel market share in Las Vegas. Although Social Rewards is primarily in travel and hospitality now, Morin and Uesugi have immediate plans for expansion to new markets and industries including entertainment and consumer product sectors.